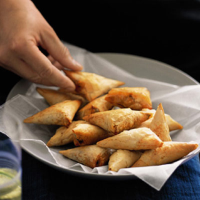 The prefect home-made nibble to start a meal or drinks party. Fry the chorizo in a large, non-stick frying pan until it releases its oil. Add the onion and cook, stirring often, for 2-3 minutes. Pour in the tomatoes and simmer for 15 minutes, until thickened. Stir in the peas and basil, and season. Remove from the heat and leave to cool. 2 Preheat the oven to 200°C, gas mark 6. Lay a sheet of filo pastry on a clean chopping board and cut in quarters lengthwise to create 4 long strips. Brush 2 of the strips with olive oil and lay another strip on top of each one. Spoon a rounded teaspoonful of the chorizo mixture on one corner of the pastry and fold over to form a triangle shape. Continue folding in a triangle shape until you reach the end of the strip. Repeat with the remaining pastry to make 24 mini bites. Brush with oil and place on a baking sheet. Bake for 10-15 minutes, until golden. Make these bites vegetarian by replacing the chorizo with 1 small chopped aubergine and 1 small deseeded and chopped red pepper.